Last week Peanut turned one! I can't believe how quick it has gone. It has definitely been a busy non stop year. 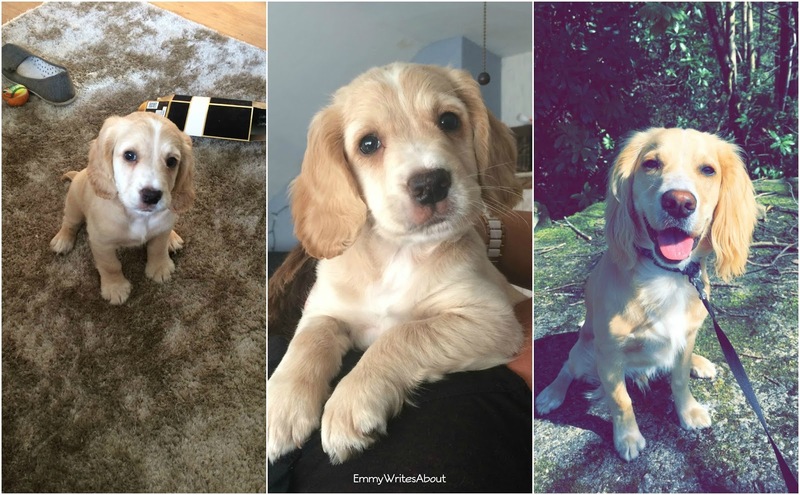 When we first got Peanut people would ask what he was and we would say Spring Spaniel and we would get "Oh you know they are nuts" or "oh good luck"... We never understand why until we had him around 3 months. Spaniels are nuts, I now get why people say they are a handful! It was me who picked his name and Peanut definitely suits him, everyone loves his name. We have two cats Ebony and Thomas who took a while to adapt to him but they now have a love/hate relationship. He is such a happy adorable dog, he's never sad and always wants to cheer you up. He was so tiny when we got him and him next to Ruby, my partners boxer dog makes him look even smaller. In the middle picture he is watching me take blog photo's which I can't do with him anymore as he loves to grab my brushes or products and legs it! His favourite game is chase... he will grab anything then you have to chase him around the living room, into the kitchen and back round. He would play chase all day if he could. He is one spoilt pup. He loves to be held like a baby and have cuddles. If you ask him for kisses he gives you a big sloppy kiss. Although if you dare yawn when he is around he crosses boundaries and tries to shove his tongue down your throat! In the mornings he is the cutest. My mum goes to work at half 7 and my alarm is set for 7. I have my bedroom door shut but he sits outside my door and waits until he hears my alarm go off then he charges at my door to make sure I am up! His favourite place to be is on top of the sofa. He just about fits on top of it. He has fallen off a few times though bless him. At the moment I stay at mine half the week and at Ashley's half of the week. When I come home on a Sunday evening he gives me the best welcome home. He goes absolutely loopy running circuits around the house. If you ask him to get his baby he will go get one of his toys for you. He is one vocal pup too! We live next to a farm and when he sits on the top of the sofa he can see down to the farm. When they have sheep in he doesn't like it. He will bark at them as they are too close to our garden haha. When people see him they always seem to assume he is a girl! They say he is to pretty to be a boy. He is definitely a hansom boy. His latest thing is to find socks and dart under my bed so I can't get him... little ****. Peanut has helped me massively to help me get mobile again after my reconstruction surgery and he has helped build my confidence. I honestly don't know what I would of done without him. He is more than just a pet, he is part of the family. Seeing his face cheers me up when I have bad days.